The Supreme Court has temporarily blocked a restrictive Louisiana anti-choice law from going into effect Thursday, in a major victory for reproductive rights advocates. The case was seen as a litmus test for determining whether millions of women across the nation will continue to have access to abortions. The Supreme Court has temporarily blocked a restrictive Louisiana anti-choice law from going into effect Thursday, in a major victory for reproductive rights advocates. The case was seen as a litmus test for determining whether millions of women across the nation will continue to have access to abortions. The divided court ruled 5 to 4 in favor of an emergency appeal by a Louisiana-based abortion provider, Hope Medical Group for Women, to temporarily block a Republican-backed law that could have left the state with just a single doctor legally allowed to perform abortions. The law requires doctors who perform abortions to have admitting privileges at a hospital within 30 miles of their clinics. 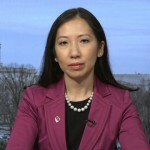 Pro-choice groups call such statutes TRAP laws, or “targeted regulation of abortion providers.” Dr. Leana Wen is the president of the Planned Parenthood Federation of America and the Planned Parenthood Action Fund. After months of anticipation, Democratic New York Congressmember Alexandria Ocasio-Cortez and Massachusetts Senator Ed Markey introduced a resolution for the Green New Deal Thursday, presenting a sweeping plan to achieve net-zero greenhouse gas emissions in 10 years, make major investments in public transit and federal jobs, fully transition the U.S. electricity off fossil fuels and codify indigenous peoples’ rights to prior consent and approval for decisions that affect them. Democratic House Speaker Nancy Pelosi seemed to mock the proposal on Wednesday, referring to it as a “green dream, or whatever they call it.” Journalist Kate Aronoff is a fellow at the Type Media Center and a contributing writer to The Intercept and Jacobin. Trump administration officials are acknowledging that there may be thousands more missing immigrant children who were separated from their parents than originally reported. This was the focus of a hearing on Thursday of the House Energy and Commerce Subcommittee on Oversight and Investigations. Lee Gelernt is the deputy director of the ACLU Immigrants’ Rights Project. He is the lead lawyer on the ACLU’s national challenge to the Trump administration’s family separation practice. He testified at the hearing yesterday.